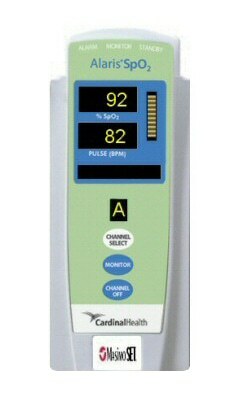 The Alaris 8220 SpO2 module features a functional blood oxygen saturation percentage, pulse rate, pulse bar, channel identification and scrolling messages display. It also features alarm limit settings, trend data and plethysmographic waveforms display. In addition, the Alaris 8220 series also has monitoring technology to allow for monitoring below selected alarm limit for a period of time before audible alarm sounds as well as the ability for accurate readings under extreme conditions.